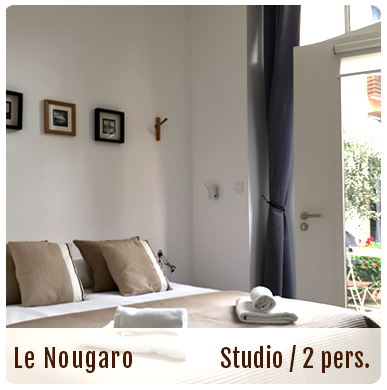 Our residence is composed of 6 apartments, built around a small courtyard typically from Toulouse in order to be rent short and medium duration. It's located 3 rue des Azes the heart of Toulouse, the capital of the Midi-Pyrénées that will seduce you by its Renaissance hotels, bridges over the Garonne and local food. 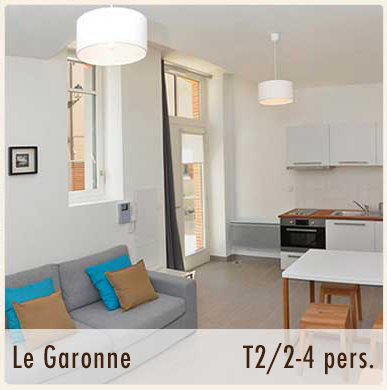 Not far from the romantic banks of the Garonne, you can make long walks, enjoying the urban landscape of the city'' s architecture so popular. José Bataller and Eric Carbonne welcome you in this personal and refined setting. 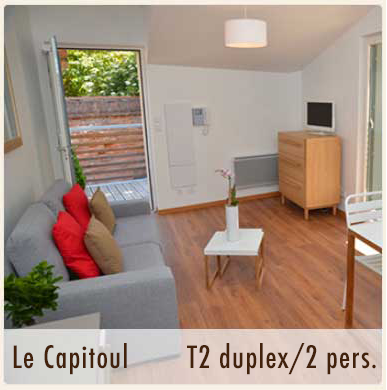 Our two piece possess a fully equipped kitchen, dining area and air-conditioned lounge area, and the CAPITOUL GARONNE possess a terrace to relax after your cultural or professional visits. 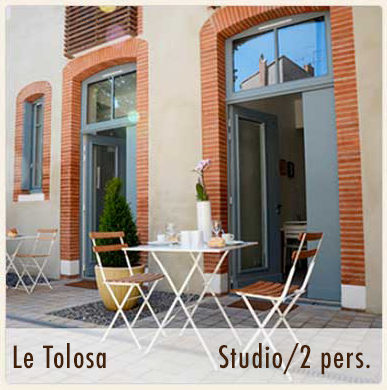 Our studios equipped with kitchen and sofa bed COMFORT possess corner terrace for lunch or dinner. 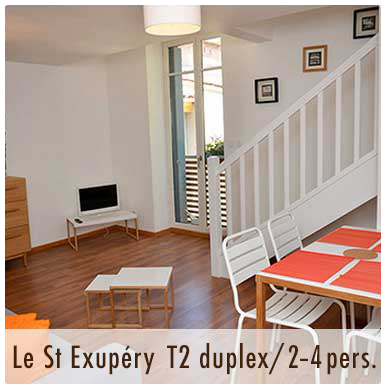 The Clos des Salins is located in the area of The Carmes, and is also close to the metro station and trams. Public parking is nearby diponible with supplement without booking beforehand. Near from the super center and all shops, 10 minutes walk from the Place du Capitole, The Clos des Salins is an ideal place to enjoy the many cultural entertainment, sports and amusement attractions. Classified 3 keys on 4 at national Clévacances France label, this classification brings "accommodations that are controlled and classified according to their equipment, their level of comfort and the quality of their facilities. External environment and welcoming owners are also taken into account in the ranking. 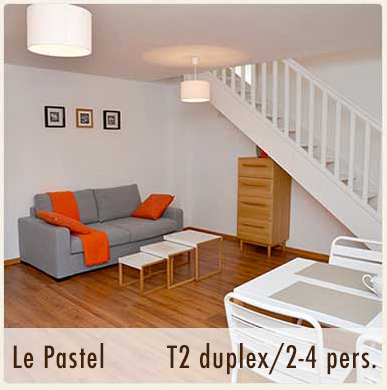 Located in the historic heart of Toulouse, the area of ​​the Carmes is connected, and highly sought secret, away from the bustle of the Capitol. The life is organized around the Place of the Carmes with its picturesque market. This place seduces by its casual side and permanent dynamic place. From bistro to restaurant, everyone crosses and gives The Carmes a friendly appearance. It is also one of the sweetest place, but not the loudest. At night, the area is transformed, quieter crowded streets and those adjoining, home bars that attract a diverse population. The geographical position of this sector allows you to do everything on foot or by bike. The Mangevins, wine bar and traditional restaurant with an original concept that we leave it to you to discover. The Petit Bacchus, the pleasure of good food and good wine. The Annexe of the Braisière, wine bar, tapas, oysters and shellfish.